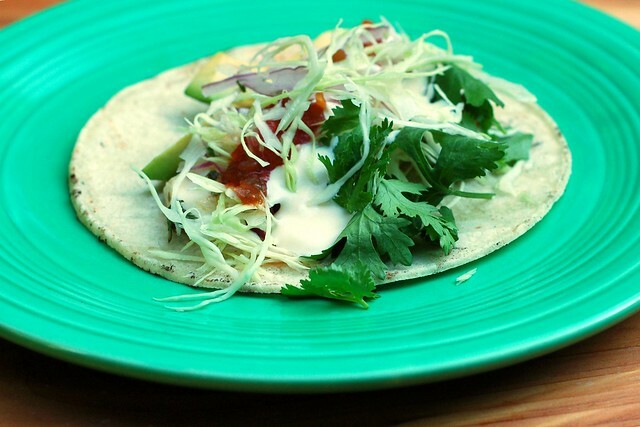 One of the first recipes I ever posted on this here blawg way back in 2007 was for Baja-style fish tacos. 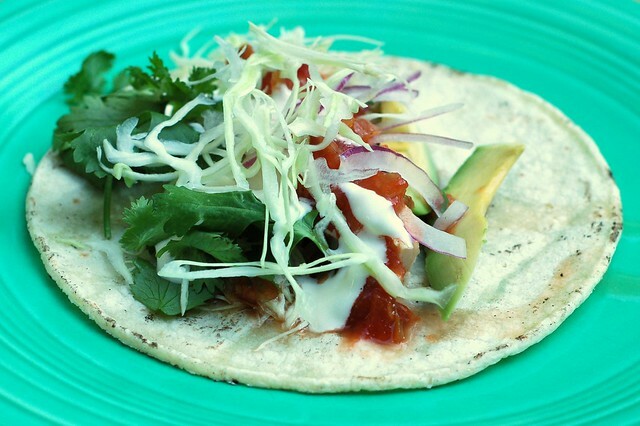 The fish is beer battered and then fried and served on corn tortillas with finely shredded cabbage, salsa and a host of delicious sides and condiments. They. Are. Simply. To. Die. For. But we still have to eat! And I still want everything to taste really good, in spite of the heat and our limited time and energy. So I've adapted a new, much easier, equally delicious, and far healthier version of fish tacos that we now make all the time. The key is that the fish is grilled, instead of battered and fried. And in addition to being quick and easy, it's so light and flavorful and delicious this way, that I don't think I will ever go back to Baja unless I am at a restaurant or maybe when both my kids have gone off to college in about a million years from now. You can use any kind of meaty white fish - tilapia, halibut, Mahi Mahi, etc. I used tilapia for this batch. 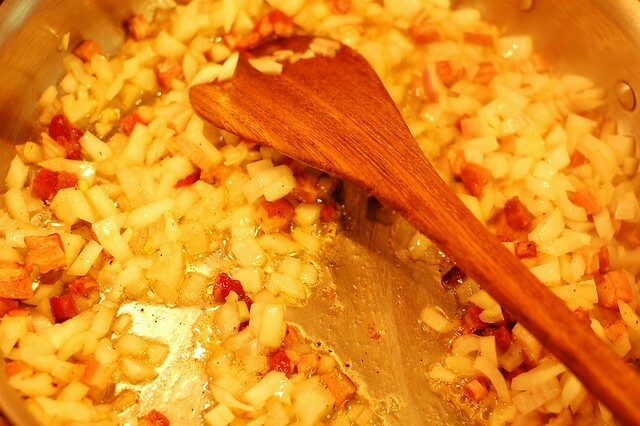 You marinate the fillets in citrus juice (lemon, lime, orange or any combo thereof is good), olive oil, salt and pepper, some cilantro or other herbs and either a little thinly sliced onion or shallot or a pressed clove of garlic. Then prep your sauces and sides. 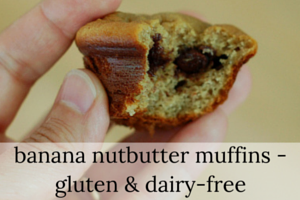 These are all really easy and yummy. Then salsa. 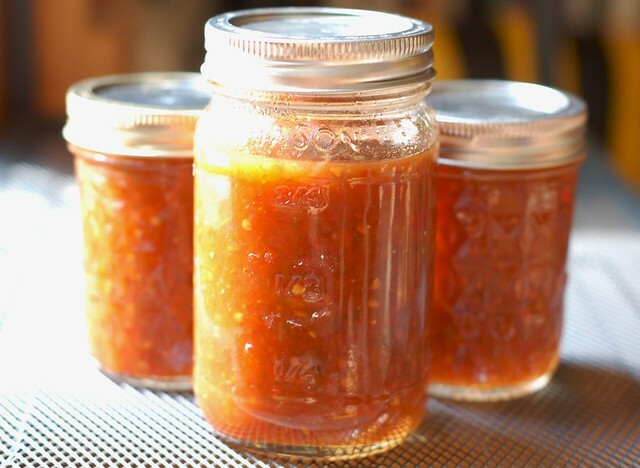 You can make your own salsa fresh or use bottled. I usually use salsa we've canned - here's my recipe. 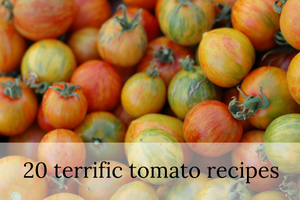 Tomato season is almost upon us and it's a great way to line your shelves with delicious homemade salsa for the entire year to come. 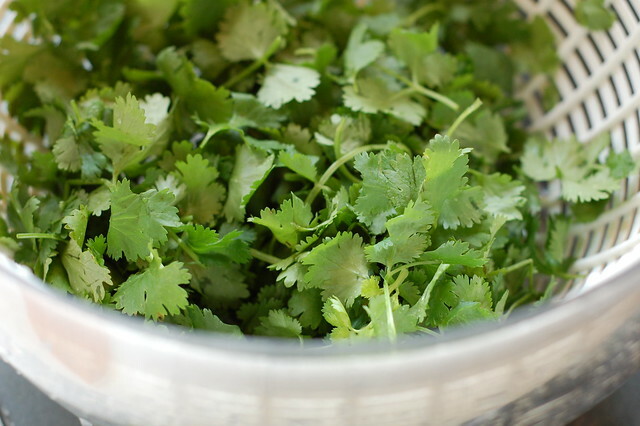 Then some fresh cilantro. 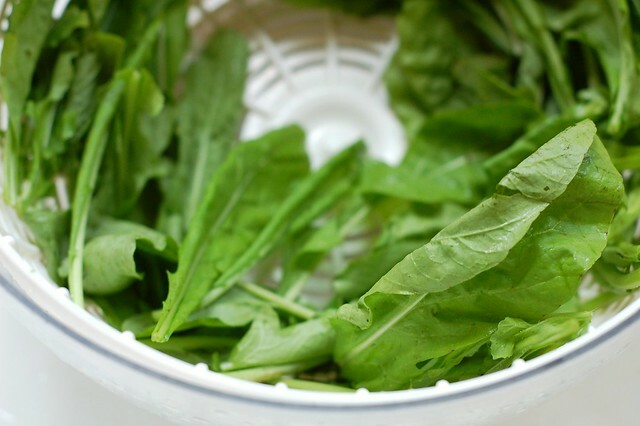 Just wash, dry and remove the stems. Then some finely sliced red onion - it's nice if you can almost see through the slices. That way people can get the flavor of the onion on their tacos without becoming a fire breathing onion monster in the process. Then the avocado. 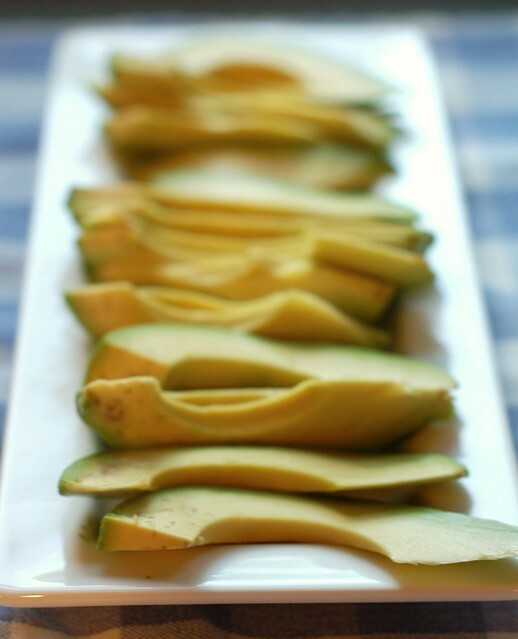 Normally, I make the avocado sauce you'll find described in the Baja post, but this last time, I made one more time-saving concession, nixing the avocado sauce in favor of plain old sliced avocados. I found it equally tasty but mucho mas quick as there was no need to tangle with the Cuisinart or wash it afterwards (a chore I despise.) 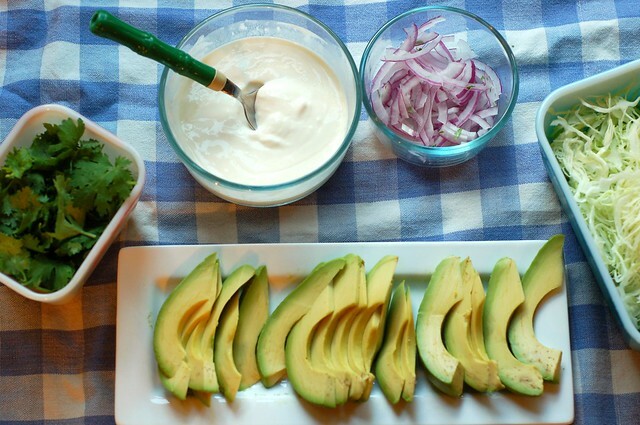 So you can either slice it and be done with it, as I did, make the avocado sauce (recipe in the Baja-style post), or make your favorite guacamole to throw on the tacos. It's all up to you. Then put it all out and go to town! You should probably plan on each person eating between 2-4 tacos (and maybe more for a large man with a big appetite) as they are smallish in size. 1. 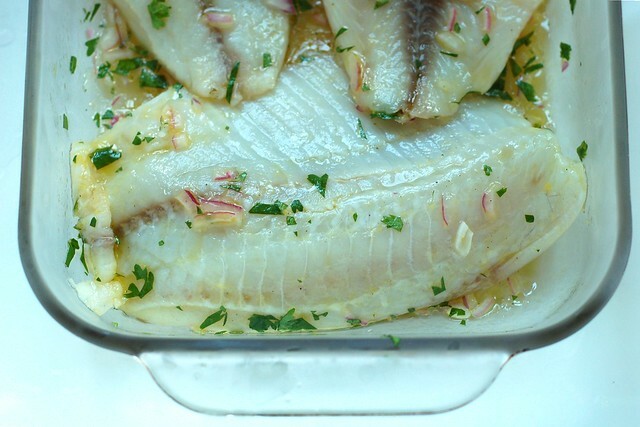 Marinate the fish in the lime juice, olive oil, herbs, onion or garlic, salt and pepper. Cover and put in fridge for at least 20 minutes and up to an hour. 2. 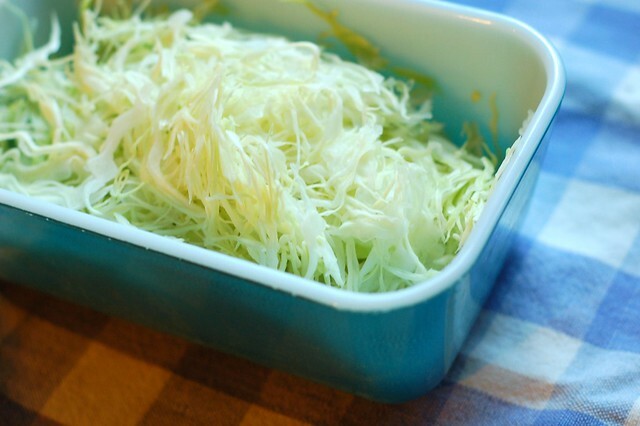 Make the mayonesa sauce: place the mayonnaise in a small bowl and add the lime juice and salt, stirring until smooth and creamy. Taste and adjust the lime and salt ratios as needed to taste. 3. Prepare the sides - this is just washing, slicing and dicing unless you decide to get fancy and make your own salsa or decide to try the avocado sauce. 4.Grill the fish. Turn your grill to high, let it heat up, then reduce the flame to medium. 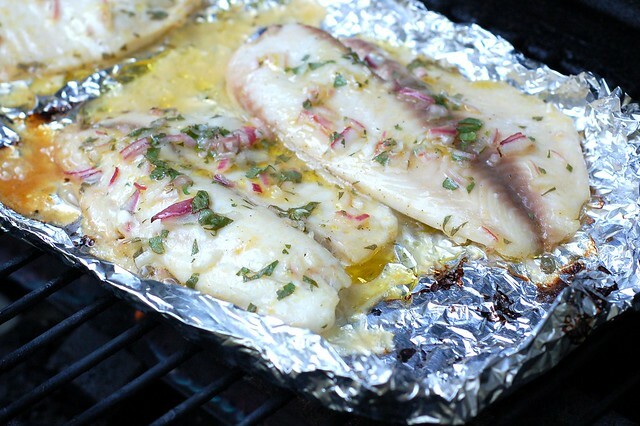 Place the fish on a sheet of tinfoil and roll the edges up to prevent juices from spilling into the flames. Grill for 5-8 minutes (time will depend on the size of the fillets you're using), until fish is cooked through and flaky but still tender and moist. 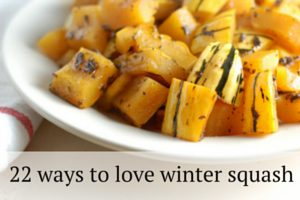 Transfer to a plate and break into serving-sized pieces. 5. 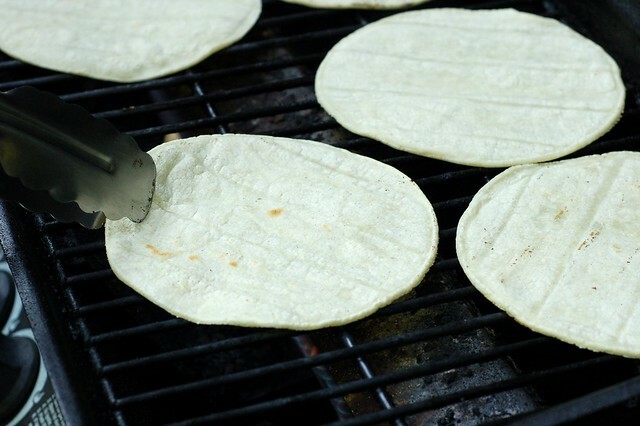 Heat the tortillas - place on grill for 10-20 seconds per side, until grill marks appear. 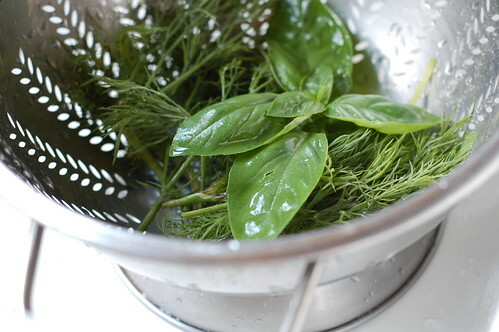 Then transfer to a basket and cover with a dishcloth to keep them warm and prevent them from drying out. 6. Put everything out on the table and let everyone assemble their own tacos. Although I never buy it, I love the look of radicchio - those thick, crisp, maroon leaves with raised white veins are so pretty! 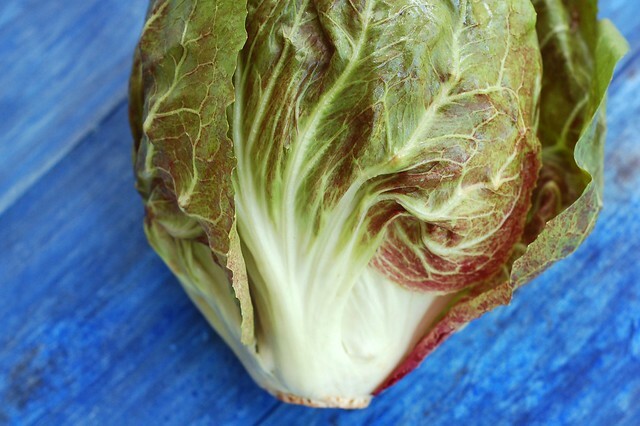 But we got a simply beautiful head of the stuff in our most recent Hearty Roots CSA share, the typical coloring of the outer leaves tinged all over with a surprising and lovely green. 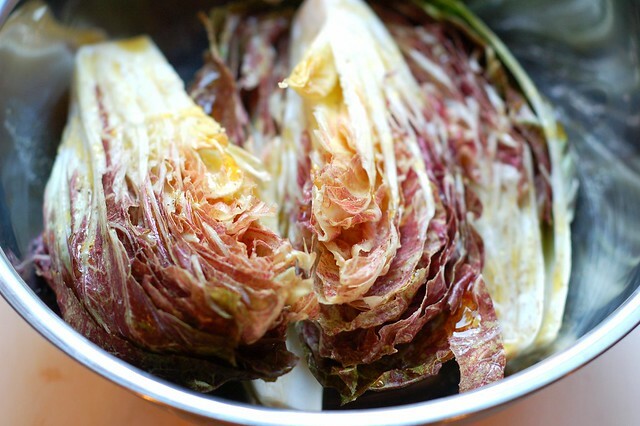 Since I never buy radicchio, I'd never cooked with it, either. 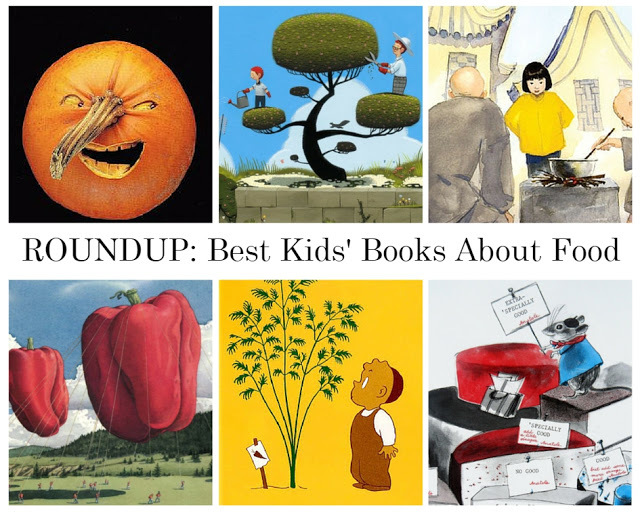 So I turned to the internet for inspiration, of course (how did we do anything before the internet???) 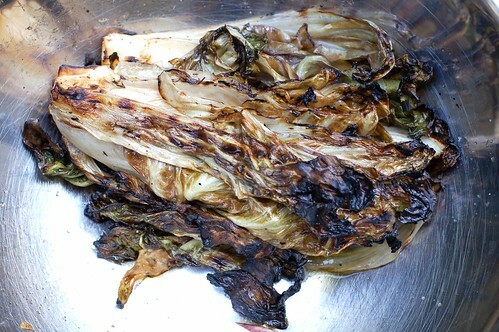 I found several simple yet yummy-looking recipes for grilled radicchio. I liked the idea that grilling the veg over high heat has a way of transforming its decidedly bitter taste to something mellowier and vaguely nutty. The rest was history. I quartered the radicchio (you want to include part of the core in each piece to prevent it from falling apart), tossed the pieces with a generous mixture of olive oil, fresh orange juice, sea salt, and freshly ground black pepper (don't skimp!) and asked my husband, our resident grillmaster, to go fire things up. 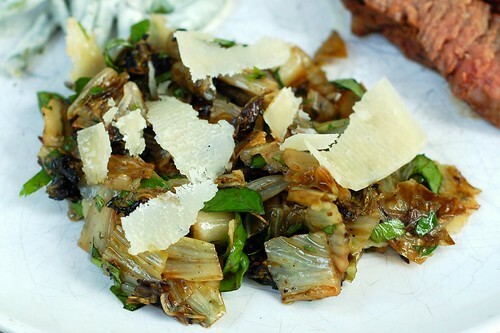 You will need to watch the radicchio wedges closely as they can burn easily and turn them often. A little char is good, too much is BAD. 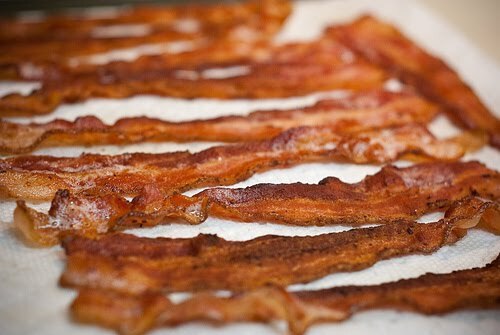 Although you could just drizzle some good quality balsamic vinegar over them once they're done and tuck in, I found the idea of a salad more appealing. Cut the wedges into chunks, drizzle with a simple balsamic vinaigrette (suggested recipe below or feel free to use your own), and shave some Parmesan cheese over the whole thing. The flavor is divine! Although some bites were still on the bitter side, I found it surprisingly addictive (sort of similar to the way I feel about this divine salad of shaved brussels sprouts, raw kale, toasted almonds and Parmesan.) The combination of the salty cheese, the sweet balsamic and the nutty, slightly bitter greens is goooood. I only had one head of radicchio but I've doubled the recipe below so you can feed four (or maybe five - depends how many people find it addictive...) with it. 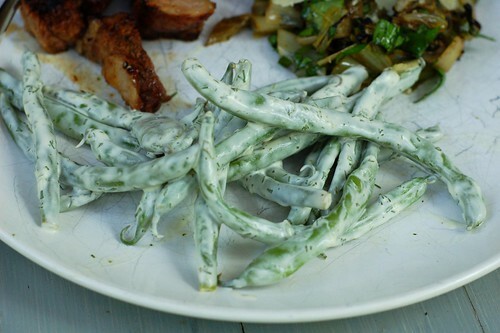 We ate ours with the scrumptious green beans with herby lemon aioli I posted recently and a delicious grilled shell steak. 2. Prepare your grill for high, direct heat. Coat quartered radicchio with olive oil and orange juice, then sprinkle with salt and pepper - make sure each piece is well-covered. 3. 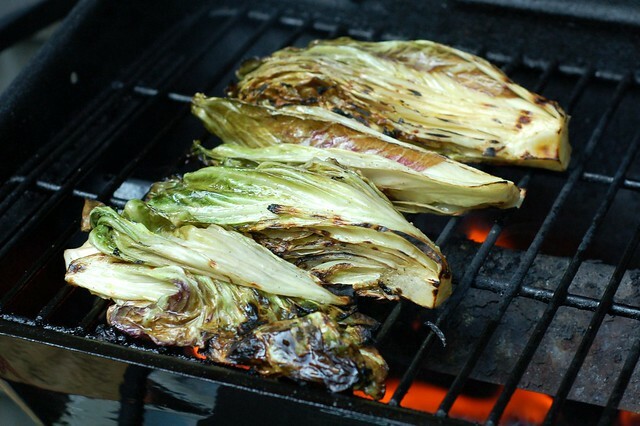 Grill the radicchio over high heat, uncovered. 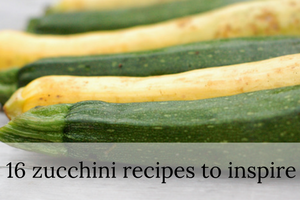 Watch closely and turn often to prevent them from charring too much. 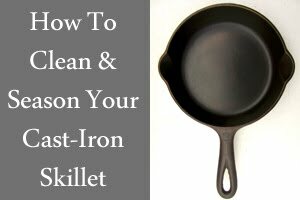 You want them cooked and lightly charred in spots but not totally blackened. 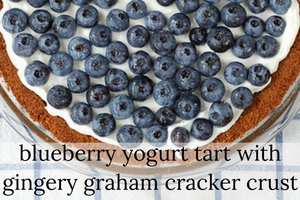 Remove to a bowl, plate or cutting board. 4. 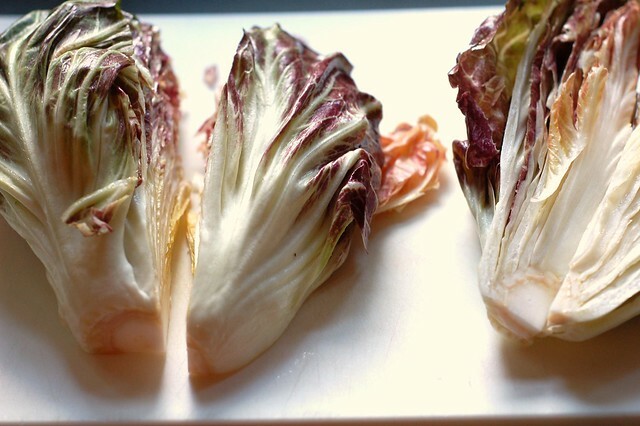 Chop the radicchio quarters into bite-sized pieces and toss with the dressing. 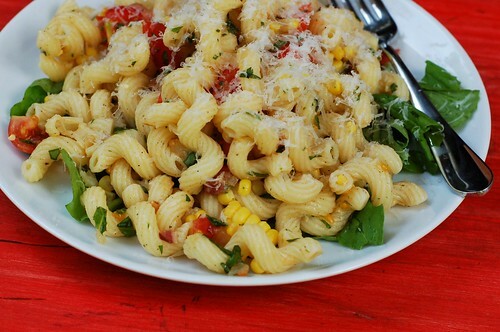 Garnish with shaved or grated Parmesan, Pecorino or Romano cheese (I urge you not to skimp on the cheese.) Serve hot or let cool down - it'd be good both ways. Summertime and the livin' is easy... I love all the delicious, flavorful veggies and fruits that are dropping off the vine/stalk/tree at this time of year. 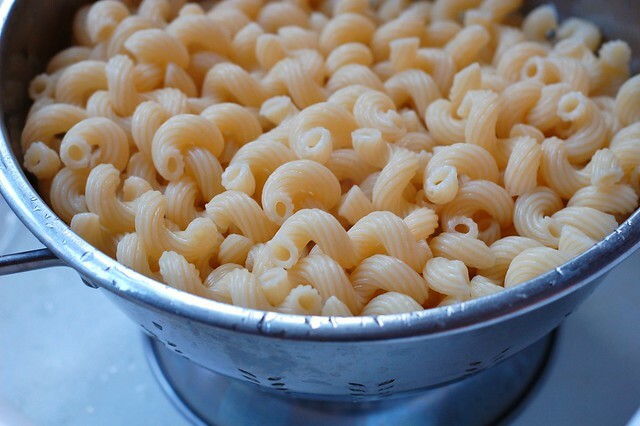 It makes cooking a joy. 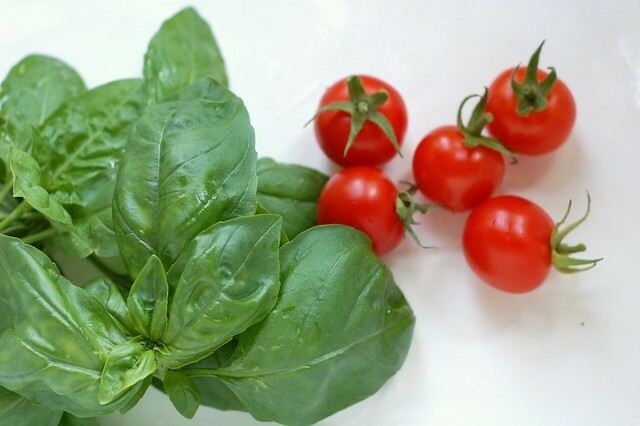 We grow herbs, green beans, tomatoes, cukes and some lettuce and arugula out on our deck. 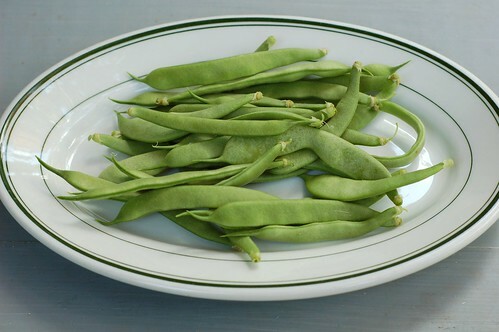 But due to limited space in the container garden, we only get a few green beans a day which I then wash, dry and put in the fridge until I've amassed enough to use. But it still only adds up to a handful or so of the delicious green monsters a week (see photo below.) So I bought some more at the Woodstock Farm Festival yesterday to supplement. 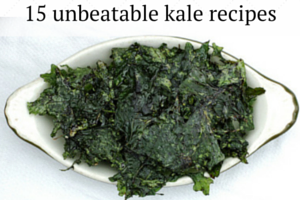 I love the creamy, garlicky, herb-filled taste you can achieve in just a matter of minutes. My suggestion is not to skimp on the salt! 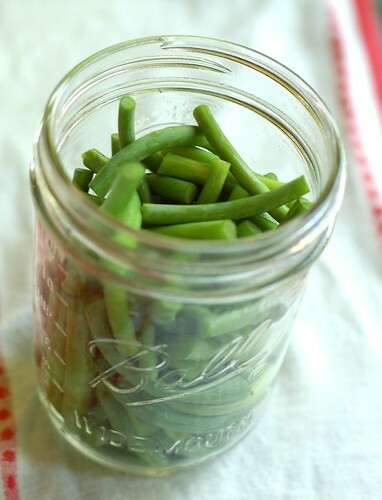 Take care not to overcook the green beans as you want to blanch them just long enough to make them tender-crisp but not so much that they get limp and bland looking. One of the keys to getting the beans right is having an ice water bath ready to stop the cooking once you remove them from the boiling water - otherwise, they will continue to cook for a number of minutes as they cool down. Toss it all together and you have a gorgeous summer side that should please everyone as it's both dairy and gluten-free (although it's not vegan due to the eggs in the mayo) which can be a plus if there are people in your life who can't or won't eat dairy/wheat/gluten. 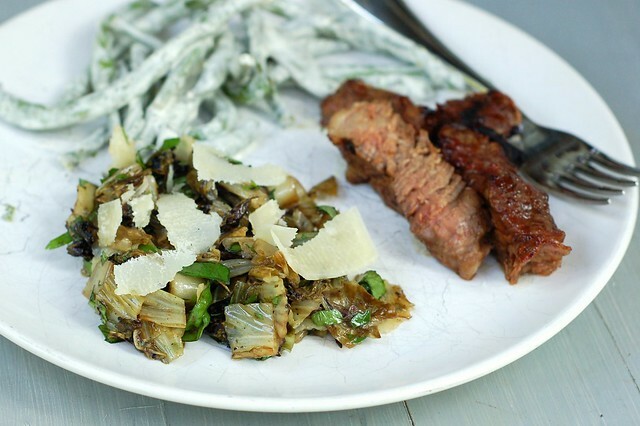 Ours accompanied grilled shell steak and a grilled radicchio and herb salad that I hope to post a recipe for very soon. 1. 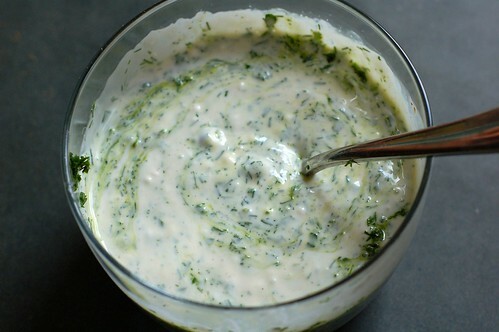 Make the aioli by combining all the sauce ingredients and stirring well. 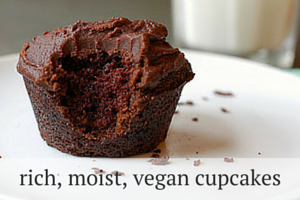 Taste and adjust the flavors as needed. It's okay if it seems a bit salty and garlicky - remember, this is going to provide the sole seasoning for a lot of green beans. You can make the aioli a day in advance if you like - the flavors only improve with a little extra time. 2. Bring a large pot of water to the boil. 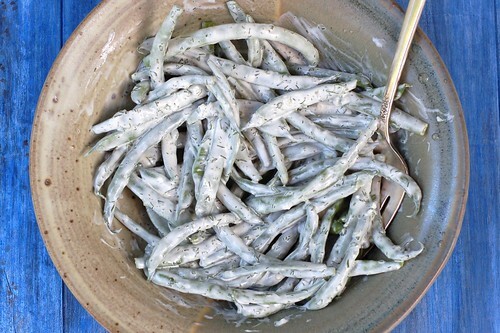 Then add the green beans and blanch then until they're just a little bit tender but still bright green - probably just 2-4 minutes (depending on the size and toughness of the beans you're working with.) While they're cooking, prepare a large pot of very cold water mixed with ice cubes so that you'll have it at the ready to put the blanched beans in - this is important so that you can stop the cooking process (otherwise, they'll continue to cook and end up overdone). 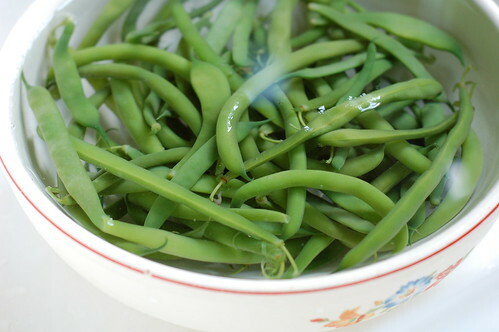 Once the beans are done, remove them from the water with a slotted spoon or by pouring them into a colander, then place them in the ice water bath for 5 minutes to ensure that the cooking stops. 3. Combine the cooled down blanched beans and the sauce, stirring with a large spoon to ensure that everything gets well-coated with the aioli and serve. 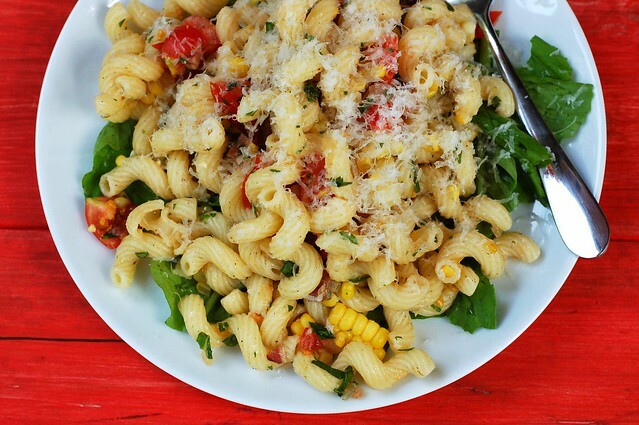 It's delicious warm or cold and goes well with nearly everything (especially anything grilled.) If it looks like there's too much sauce, save what's leftover in the fridge - it's great with grilled salmon or other fish, steamed potatoes and more. 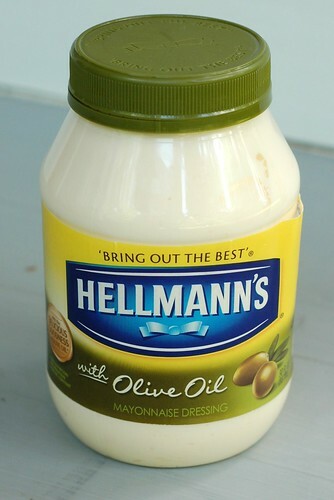 Disclaimer: I received a sample of Hellmann's Mayonnaise with Olive Oil to try, and was compensated for my ingredients and time in creating this recipe, but my opinions are 100% my own. We spent a mighty pleasant morning picking blueberries at Greig Farm yesterday - it was hot but there was a nice breeze and the blueberry bushes are actually tall enough to create a little shade. 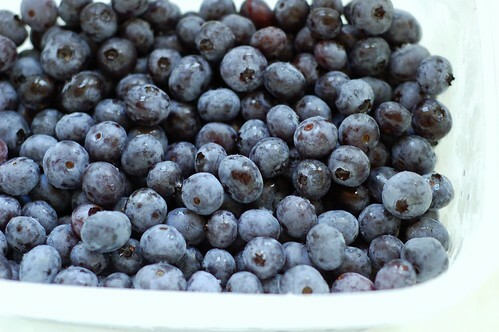 Every time we go, I am amazed all over again by how beautiful the berries are - perfectly plump and juicy with that soft, lush dusky coating that rubs off when you touch them, exposing the darker, shiny blue underneath. 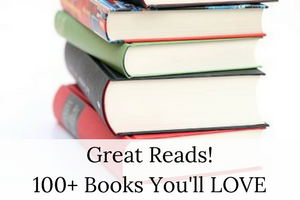 And there are just many of them, too. Sadly, this is not the case with the raspberries this year - they got frost damaged in the wacky weather we had in the late winter/early spring. 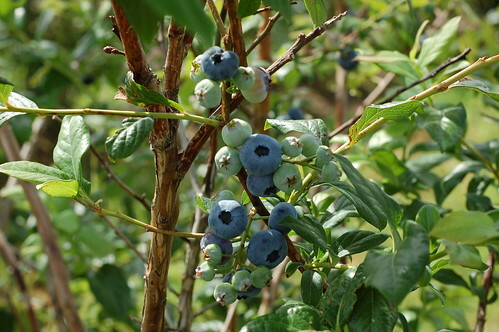 But the blueberries are going strong! I more or less stuck with the recipe though I have made it tastier and less healthy (but come on, this is a DESSERT!) 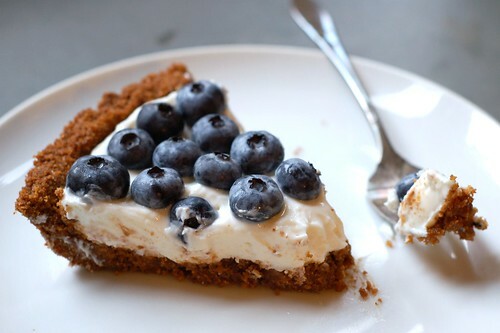 by substituting whole milk Greek yogurt for the non-fat and by basically doubling the amount of butter in the crust, adding more sugar, and removing the egg white as I did not feel like wasting an egg yolk. 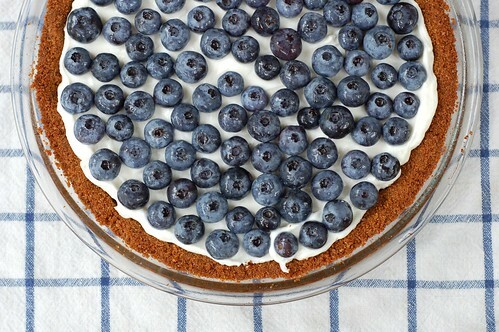 Despite the fact that all Greek yogurt has already been drained (I believe the extra draining is the only difference between Greek yogurt and other yogurts and what accounts for its characteristically firm texture), I followed the directions and drained the Greek yogurt for a number of hours before composing the tart. 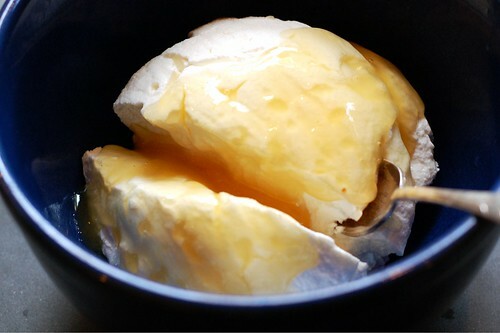 It did shed a little more water weight, becoming even firmer and creamier in the process. However, I think that if you were pressed for time, you could probably just use it as is. I could not have been more pleased with the results - it is really just scrumptious. 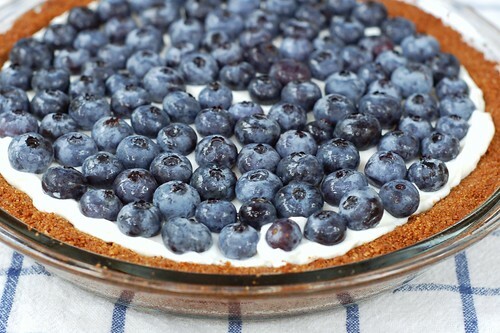 A perfect summer dessert using fresh, local berries. Go pick some or just pick some up at your local farmers' market this week - you won't regret it! 1. 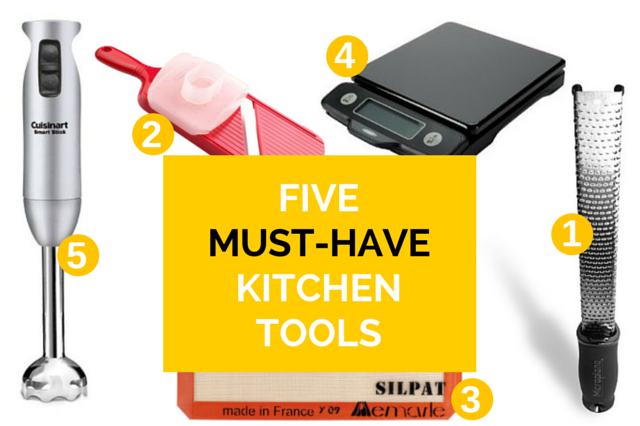 Preheat the oven to 350° and grease a pie dish or tart pan with removable bottom. 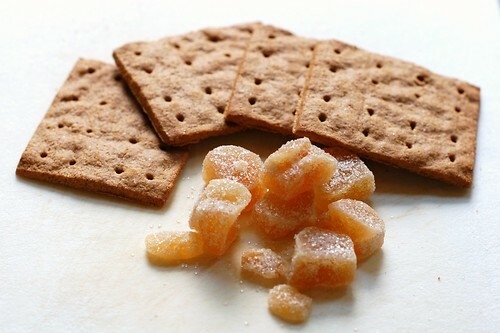 In a food processor, pulse the graham crackers with the crystallized ginger, sugar, salt and cinnamon until finely ground. Add the melted butter and pulse until the crumbs are evenly coated. We got another big bunch of garlic scapes from our CSA this week. As we've still got plenty of garlic scape pesto in the freezer from the last haul, I figured I'd try something new. 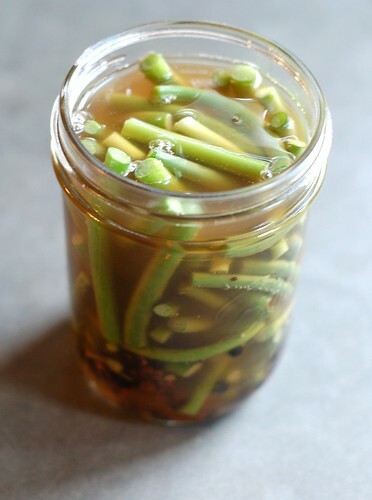 And we've been really loving both the pickled ramps and pickled asparagus we made recently so pickling seemed like the way to go. I turned to my new go-to canning Bible, Marisa McClellan's lovely, new book, Food in Jars: Preserving in Small Batches Year-Round. 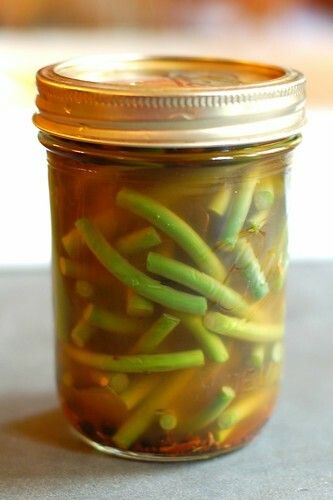 Sure enough, she had a good-sounding and very simple recipe for pickled garlic scapes. I cut her original recipe in half since I only had half a pound (have I mentioned yet how much I love my little OXO kitchen scale?!) 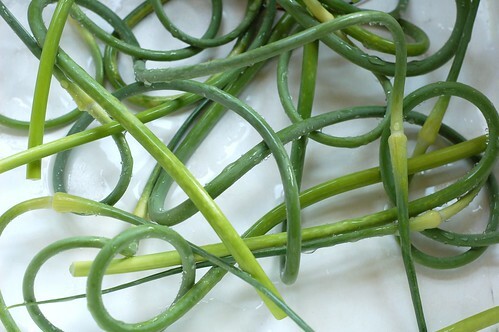 of scapes, but if you have more, just double or triple the amounts below to fit. As usual, I was trying to do at least three things at once while I made these and missed the little note at the very bottom of the page about her preferred method of packing since I was slightly at a loss because the scapes inevitably end up in both straight and curly pieces. I've included it higher up here so that YOU won't miss it. And mine will still taste just as good as if I'd packed them more neatly. Also, a note on the pickling spices - I included a lot of spices but you could also do this with just peppercorns, bay leaf and dill or coriander seeds if you don't have all of these things - nothing is set in stone! In my opinion, the only downside to this (or any pickles) is the intensely vinegar-y smell that pervades your house for a few hours after you boil your brine. But it fades and it's so worth it once you finally crack open a jar of whatever you've made. 1. Trim the ends of the scapes, both the blossom end and the hard bit that formed at the original cut, and cut them into lengths that will fit in your jar. 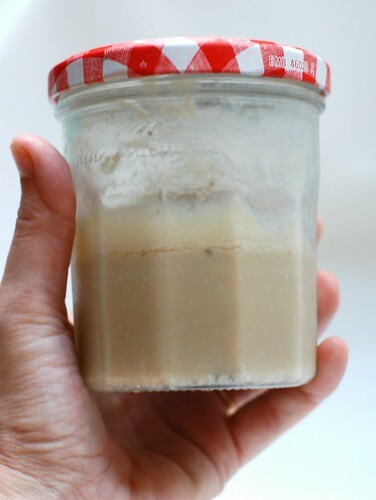 Prepare a small boiling water bath and sterilize a single pint jar, lid and band. 2. 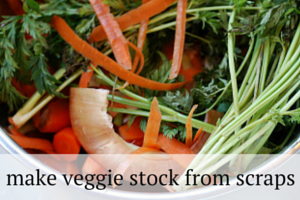 Combine the vinegar, water and pickling salt in a pot and bring to a boil. 3. 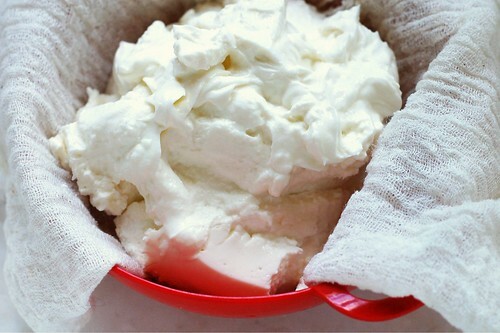 Remove the jar from the boiling water bath, empty and set on a kitchen towel. 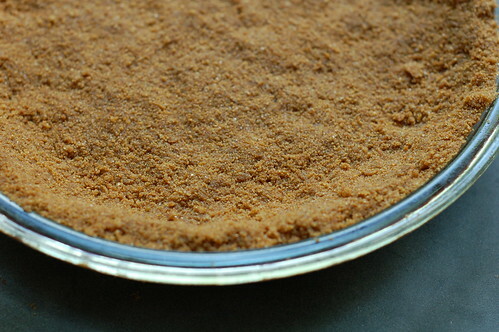 Place the spices in the sterilized pint jar along with a pinch of salt. 4. Pack the trimmed scapes into the jar. Note: since you'll be dealing with both straight and curved pieces, Marisa suggests packing the curved pieces along the sides of the jar and the straighter pieces inside standing straight up - kind of a like a curly log cabin look (or vice versa) - I ended up just putting mine all in there in no order which is also fine. 5. Slowly pour the hot brine over the garlic scapes, leaving 1/2-inch headspace. 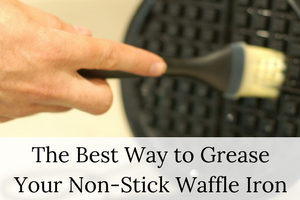 Once the jar is full, tap the jar lightly to dislodge any air bubbles. Check the headspace again and add more brine if necessary. 6. 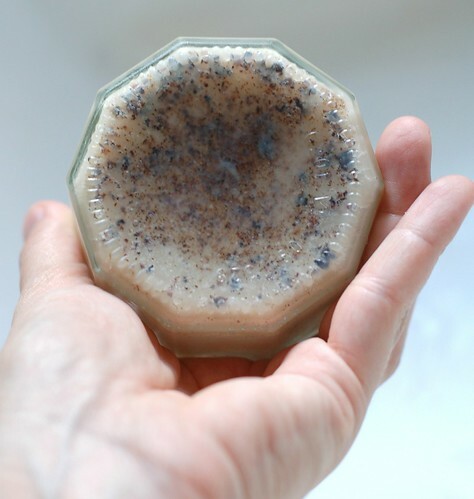 Wipe the rim, apply the lid and ring, and process in a hot water bath for 10 minutes. Let these pickles cure for at least a week before eating. Pickles will last for several weeks in refrigerator after initial seal is broken.